October courses begin officially on September 10, the focus weekend takes place October 13-14, and final assignments are due November 9. If you would like to audit a course, the tuition is $100. If you would like to take the class for credit, the tuition is $180. The cost includes meals and overnight accommodations at Upton Hall on Friday and Saturday night (on a space-available basis). If you wish to take the class for credit, we encourage you to enroll by September 10. If you wish to audit the class, you may register at any time prior to the focus weekend. However, your learning experience will be better if you have time to complete the assigned readings for the class. Bass, Diana Butler. Christianity After Religion: The End of Church and the Birth of a New Spiritual Awakening. HarperOne, 2012. Everist, Norma Cook. The Church as Learning Community: A Comprehensive Guide to Christian Education. Abigdon Press, 2002. Westerhoff, John H. III. Will Our Children Have Faith? Wipf & Stock, 1999. This course, geared for students on the Lay Evangelist track but open to all, will explore some of the fundamentals about how we communicate effectively with one and explore some of the techniques and tools to better share our stories, and those of our faith communities, with others in order to build up the Kingdom of God. Thompson, Neil. Effective Communication: A Guide for the People Professions, third edition. Palgrave MacMillian, 2018. Gortner, David & Lemler, James. Transforming Evangelism. Church Publishing, 2008. The Rev. Casey Rohleder has been a communications professional for the bulk of her professional career, working in both the not-for-profit and higher education sectors. She currently serves as Director of Communications for BKSM and rector of St. Luke's, Wamego. She holds an MA in German Literature from the University of Missouri-Columbia and a Certificate in Presbyteral Studies from the Bishop Kemper School for Ministry. The course is a study of the Gospels, Epistles, and other writings of the New Testament that gives consideration to the their historical, literary, and theological dimensions. 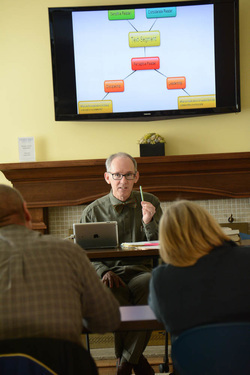 After taking this course, students will have gained a general understanding of the major stories and theological ideas of the New Testament, a basic familiarity with the variety of methods scholars use to interpret the New Testament, a basic sense of the origins and historical development of the New Testament, and an appreciation for variation and similarity within interpretations of the New Testament. Dr. Arminta Fox is Assistant Professor of Religion and Director of Peer Ministry at Bethany College in Lindsborg, Kansas. She earned her PhD in Biblical Studies from Drew University Theological School in Madison, New Jersey in 2015. A New Testament scholar, Dr. Fox’s primary areas of research include the complex development of identity in biblical texts and early Christian history, feminist biblical scholarship, contextual hermeneutics, and material culture. Her first book, “Paul Decentered: Reading 2 Corinthians with the Corinthian Women,” will be published by Lexington/Fortress Academic in 2018. This work analyzes how Paul’s letters, particularly 2 Corinthians, witness to complex debates between Paul and the communities in which he worked. Old Testament IThis course is a basic introduction to the historical setting, literary artistry, and major themes of the Hebrew Bible/Old Testament (HB). The course will address the biblical text canonically, while at the same time exploring the individual nature of the texts that make up the canon. The course is meant to equip participants with the tools necessary to read biblical texts critically and to appreciate their complexity. To these ends we will read the biblical text primarily from the perspectives of its ancient authors and readers. Michael D. Coogan and Cynthia R. Chapman, The Old Testament: A Historical and Literary Introduction to the Hebrew Scriptures (4th ed. ; New York: Oxford University Press, 2017). Walter Brueggemann, Bruce C. Birch, Terrance E. Fretheim, David L. Peterson, A Theological Introduction to the Old Testament (2nd ed. ; Nashville: Abingdon Press, 2005). Dr. Melissa Tubbs Loya has a PhD in Hebrew Bible from Boston College and a masters in the subject from Yale Divinity School. Her current research interests focus on prophetic warnings of decreation. She lives in Omaha with her husband and two children.